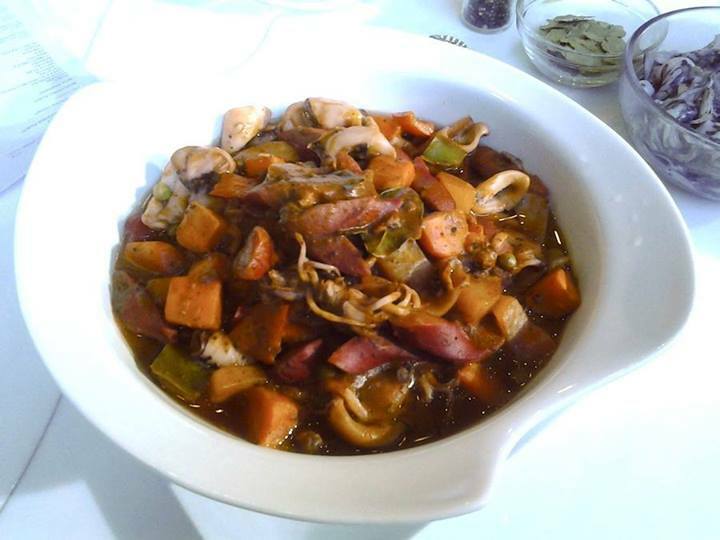 Here's Unang Hirit Kitchen Hirit Recipe of the Day- August 30, 2013: Menudong Pusit with Chef Zandra Tepait. 1. Igisa ang sibuyas, bawang at pusit kasama nang dahon ng laurel ng dalawang minuto. Pagkatapos, itabi ito. 2. Igisang muli ang bawang at sibuyas. Isama na rin ang hotdog. 3. Isama na rin ang carrots at patatas. 5. Lagyan ng kaunting tubig. Pakuluan. 6. Ilagay ang naunang iginisang pusit. 7. Ilagay ang tomato sauce at haluin. 8. Ihalo ang green peas. 9. Haluin sa loob ng isang minuto. Ihain. This Saturday (August 31), Asia’s Songbird Regine Velasquez-Alcasid will invade the controversial “1720 Condo Unit” of Eric and Vincent in My Husband’s Lover(MHL). Sought-after Kapuso actor Tom Rodriguez will prepare Sausage and EggplantPasta. Aside from his talent in cooking, Tom will also display his skills in graphic design and illustration as he sketches a portrait of Asia’s Songbird. Also joining Tom are his co-stars Victor Basa and Kevin Santos better known in the series as David and Danny, respectively. 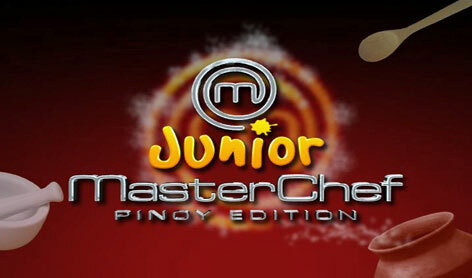 The two guys of MHL will also showcase their kitchen skills as they prepare Bulalo Steak. 1. Sa isang kawali, igisa ang bawang at sibuyas. 2. Idagdag ang hiniwang lechon at pampalasa. Hayaang kumulo sa loob ng limang minuto. 3. Lagyan ito ng tubig at muling pakuluin ng 30 minuto. 4. Timplahan ito ng toyo at patis. 5. Dagdagan ng cornstarch upang lumapot ang sabaw. 6. Ilagay ang itlog at haluin. 7. Idagdag ang noodles at paminta. 8. Haluin at hayaang maluto sa loob ng 5 hanggang 8 minuto. with Chef Kia Del Rosario. 1. Lagyan ng kaunting alamang ang ginisang bawang, sibuyas at luya. 2. Ihalo ang pinakuluan at nilamas na balun-balunan sa asin at kaunting suka. 3. Ilagay ang pinakuluang balunbalunan at langka. 4. Lagyan ng tubig at hayaang kumulo. 6. Kapag malambot na ang langka, ilagay ang malunggay at sili. Naghanap ang Pop Talk ng 3 breakfast places na bukas 24/7. "Nag-join sa pagre-review ang Kapuso hunk na si Carl Guevarra!" Vidoe embed only from YouTube. 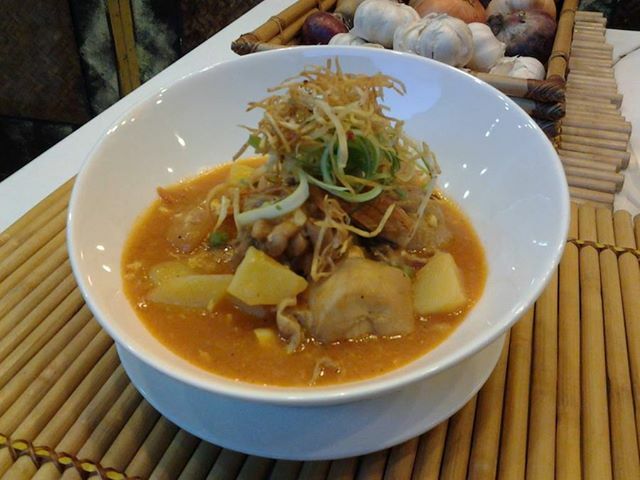 Here's Unang Hirit Kitchen Hirit Recipe of the Day: Soupy Chopseuy with Giniling with Chef Jionne Ocinar. 2. Idagdag ang pork giniling sa ginisa at hintayin itong maging kulay brown. 3. Lagyan ng asin, paminta, asukal at 3 tasa ng tubig. 4. Pakuluan at isimmer sa loob ng 2-3 minutes. 5. Ilagay ang sayote, patola, carrots at haluin sa loob ng 2-3 minutes. 6. Idagdag ang bell pepper, kinchay, mushroom at quail eggs. 7. Haluin sa loob ng 3 minutes. 8. Lagyan muli ng asukal, asin at paminta. 9. Lagyan ng corstarch na tinunaw sa tubig upang lumapot ang sabaw. 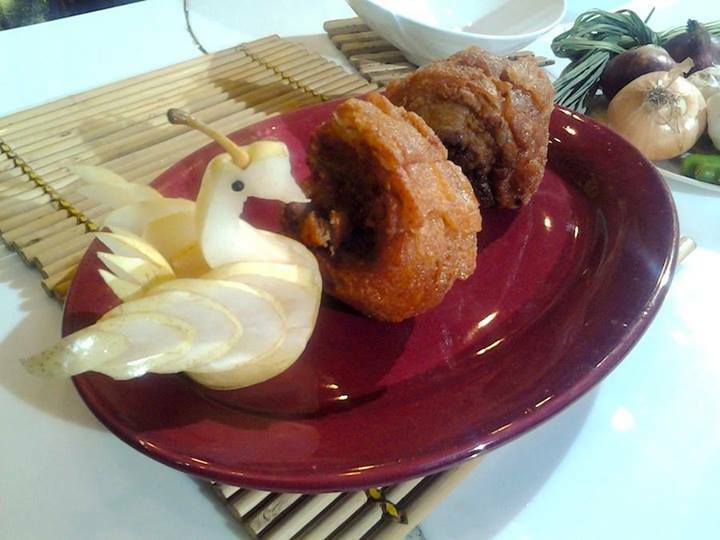 Here's Unang Hirit Kitchen Hirit Recipe of the Day- August 26, 2013: Kinulob na Manok with Nancy Reyes-Lumen. 1. 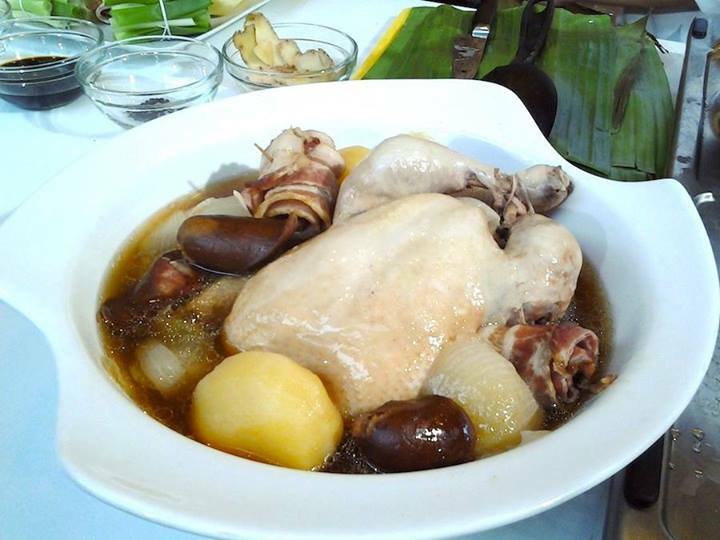 Sa isang kaserola, pakuluin sa tubig ang mantika, isang buong manok, sibuyas, patatas, sibuyas na mura, ham bones at chorizo bilbao. 2. Habang kumukulo ay hinaan ang apoy at hayaang maluto sa loob ng 45 minutes o hanggang mabawasan ang sabaw nito. 3. Timplahan ito ng asin at paminta. 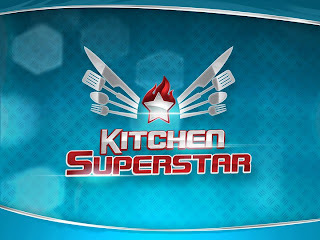 Here's Idol sa Kusina Recipe- Episode 106/Aug. 25- COOKIES & CREAM SMOOTHIE. 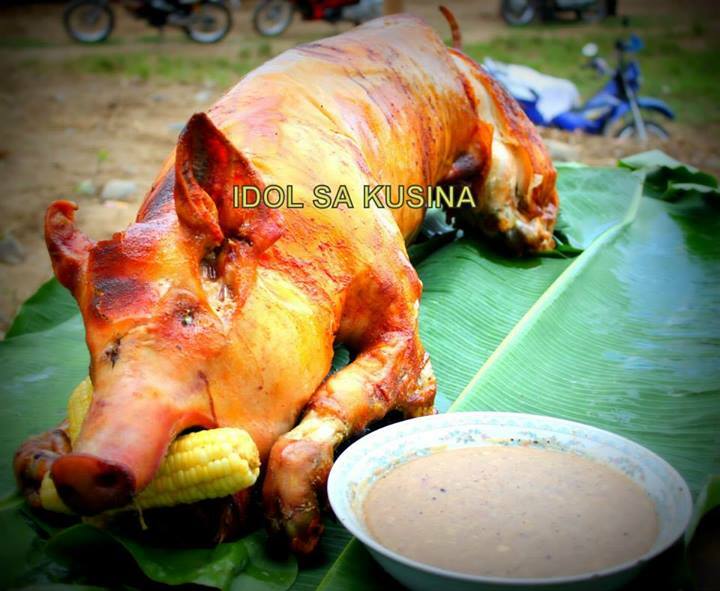 Here's Idol sa Kusina Recipe for Episode 106-/Aug. 25- SPARE RIBS WITH POTATO BOMBS. BARBEQUE SAUCE: Heat butter and olive oil in a large pan, add onions and saute until just soft. Add garlic, tomato puree, brown sugar, Worcestershire sauce, white wine vinegar, chili powder and paprika and bring to a simmer. Set aside. DRY RUB: Combine all ingredients and set aside. PORK RIBS: Rub the spareribs with the dry rub and grill. Baste with the barbecue sauce on both sides until ribs are done and cooked. Place cheeses in the cored potatoes and cove the hole with the potato log. 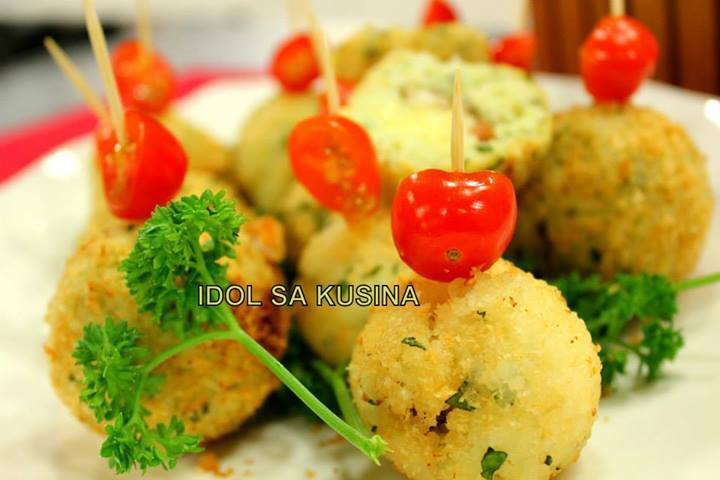 Here's Idol sa Kusina Recipe for Episode 106/Aug. 25- CORNED BEEF WITH HERBED POTATOES. 1. Place the water into a large stockpot along with salt, sugar, salt, cinnamon stick, mustard seeds, peppercorns, cloves, allspice, bay leaves and ginger. Cook over high heat until the salt and sugar have dissolved. 2. Remove from the heat and add the ice. Stir until the ice has melted. 3. Once it has cooled, place the brisket in a zip top bag and add the brine. Seal and lay flat inside a container, cover and place in the refrigerator for 7 days. 4. After 7 days, remove from the brine and rinse well under cool water. Place the brisket into a pot, add the onion, carrot and celery and cover with water. Set over high heat and bring to a boil. Reduce the heat to low, cover and gently simmer for 2½ to 3 hours or until the meat is fork tender. 5. Remove from the pot and thinly slice across the grain. 6. Garnish with parsley and serve with herbed potatoes. 7. For herbed potatoes, melt butter in pan, add oil then toss in herbs and potatoes and mix well. 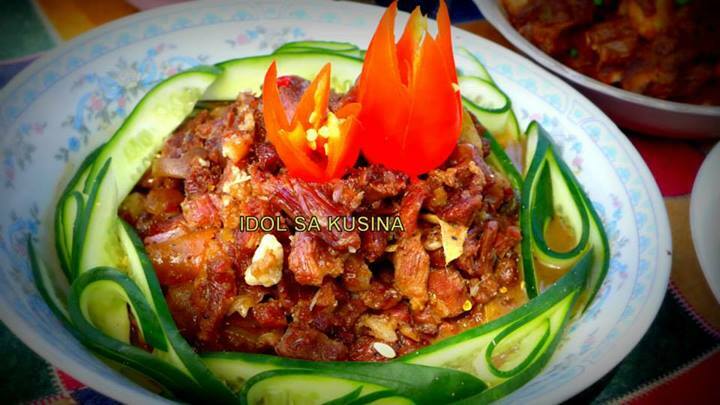 Here's Idol sa Kusina Recipe for Episode 106/Aug. 25- AMERICAN FRIED CHICKEN AND WAFFLES. 1. Soak chicken in water and salt at least 2 hours in the refrigerator. 2. Mix buttermilk, eggs and Season All and dip chicken pieces in this mixture. 3. Combine flour, oregano, and Season All salt in a bag. 4. Drop dipped chicken in the bag at one time. 5. Deep fry in hot oil until golden brown and done. 6. Serve with waffles and drizzle with honey. 1. 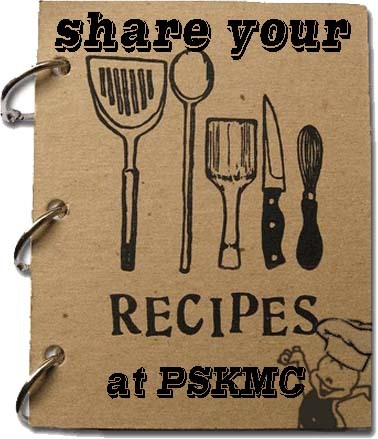 In a large bowl, mix together flour, salt, baking powder and sugar; set aside. 2. In a separate bowl, beat the eggs. Stir in the milk, butter and vanilla. Pour the milk mixture into the flour mixture; beat until blended. 3. Ladle the batter into a preheated waffle maker. Cook the waffles until golden and crisp. Serve immediately. 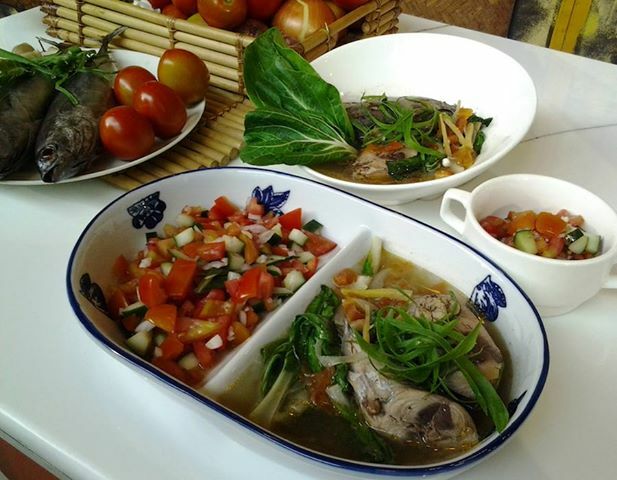 Here's Unang Hirit Kitchen Hirit Recipe of the Day-August 23, 2013: Tinolang Manok with Miswa with Chef Mikel Zaguirre. 1. Pagkatapos igisa ang mga pampalasa, ihalo ang tanglad, patis at paa ng manok. 2. Iluto hanggang sa mag-brown ang paa ng manok. Samahan ng sili para sa broth. 3. Lagyan ng asin, paminta at asukal ang manok na tinanggalan na ng buto. 4. Pahiran ng bawang, luya at tanglad saka buhusan ng patis, mantika at kalamansi ang manok. Iprito. 5. Idagdag ang pinakuluan nang sayote. 6. Paghalu-haluin ang mga sangkap. Dagdagan ng sili. 7. Ilagay ang miswa at dahon ng sili sa broth. 8. Isama ang pechay o bokchoy. 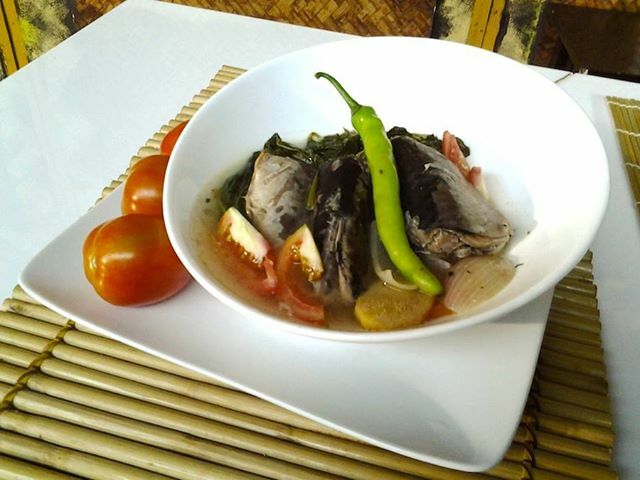 Here's Unang Hirit Kitchen Hirit Recipe of the Day- August 22, 2013: Nilagang Buto-buto ng Baka with Sotanghon with Chef Ric Loterio. 1. Pakuluan ang buto buto ng baka kasama ang sibuyas, patatas at carrots. 1. Lutuin ang nahiwang manok sa kawali at ihalo ang pork sausages, nahiwang mga bell pepper at siling labuyo. Igisa ng 5 minuto saka itabi. 2. Ilagay ang mantikilya sa pinag-gamitang kawali at igisa ang bawang at sibuyas. Haluan ng tomato paste at iluto ang paste para mabawasan ang asim at hilaw na lasa nito. 3. Lagyan ng tomato sauce, toyo at chicken stock para maging sinabawan. 4. Ibalik ang manok na sangkap sa kawali at ihalo ang patatas at carrots hanggang itong lahat ay lumambot at maluto. 5. Para madagdagan ang lasa mag lagay ng asukal. 6. Budburan ng asin at paminta. 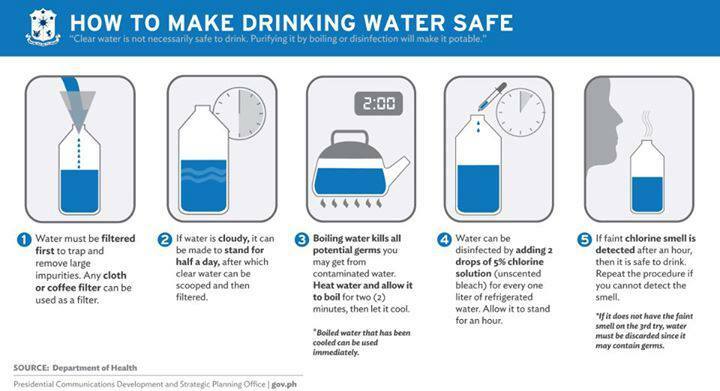 Guidelines from the Department of Health on purifying water. Here's Guidelines from the Department of Health on purifying water. Tropical cyclone Maring (Trami) intensified into a tropical storm Sunday afternoon, even as state weather forecasters warned of possible flash floods and landslides over Metro Manila and parts of Luzon in the next 24 hours. If you or anyone you know is in need of rescue, you can enter their details in the form on the link above. Concerned rescue agencies can download and copy this database to help facilitate rescue efforts. 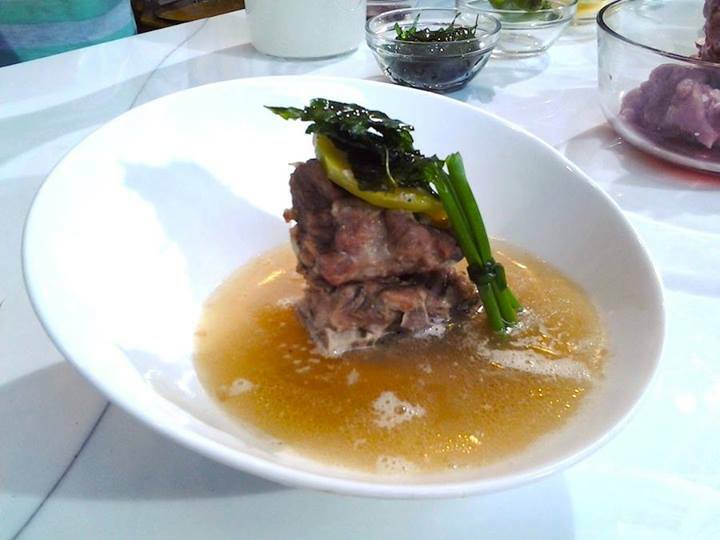 Here's Unang Hirit Kitchen Hirit Recipe of the Day- August 19, 2013: Sinigang na Buto-buto ng Baka sa Bayabas with Chef Duy Baltazar. 1. Sa isang kaserola, pakuluan hanggang sa lumambot ang baka. Lagyan ng tamang dami ng asin. 2. Ilagay ang siling pang-sigang at okra. Hayaang kumulo pa hanggang sa maluto ang gulay. 3. Huling ilagay ang kangkong. Tikman at i-adjust ang lasa. Maaari ding timplahan ng patis sa halip na asin. 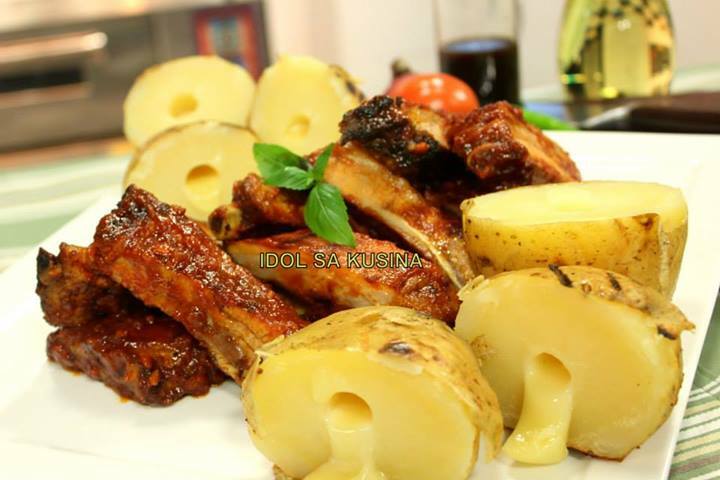 Here's Idol sa Kusina Recipe for Episode 105/Aug. 18- RICE TEA WITH LEMON GRASS. 1. In a pot, brown the rice without any oil on medium high heat. 2. Once browned, place rice in a cheese cloth and tightly secure to make a teabag. Add in water and lemongrass into the same pot and simmer with the browned rice teabag. 3. Steep for 5-7 minutes and serve. Add honey if preferred. 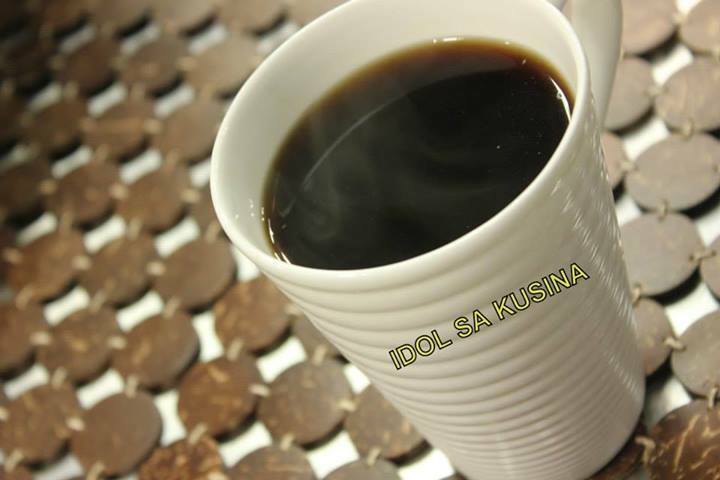 Here's Idol sa Kusina Recipe for Episode 105/Aug. 18- STUFFED RICE BALLS. 1. Breading: Put the bread crumbs in a medium bowl. Set aside. 2. Filling: In a medium bowl, combine the rice, bread crumbs, parmesan, basil, and eggs. With damp hands, form the mixture into balls. Make a hole in the center of each ball and insert a cube of cheese, mushroom and sausage. Cover up the hole to completely enclose the stuffing and roll the balls in breadcrumbs to coat. 3. Deep fry rice balls until browned. Place into a plate, top with cherry tomatoes and secure with toothpicks. And garnish with parsley. 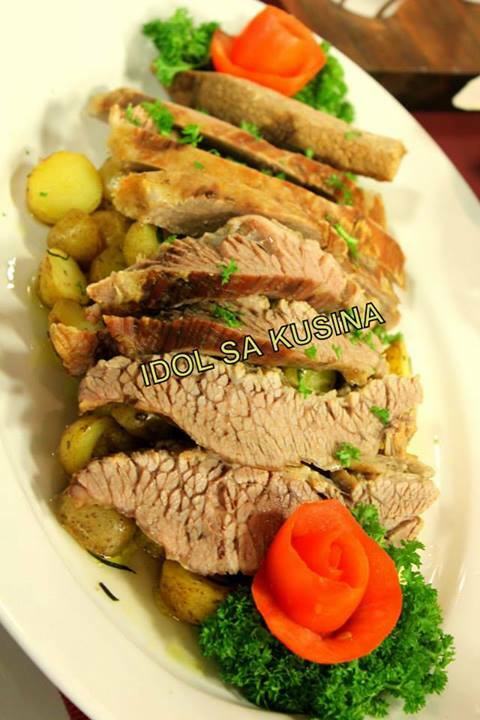 Here's Idol sa Kusina Recipe for Episode 105/Aug. 18- MAGIC TUYO RICE. Saute garlic in hot oil until golden brown. Add tuyo, rice and tomatoes. Cook for 3 minutes. Season with MAGGI MAGIC SARAP. 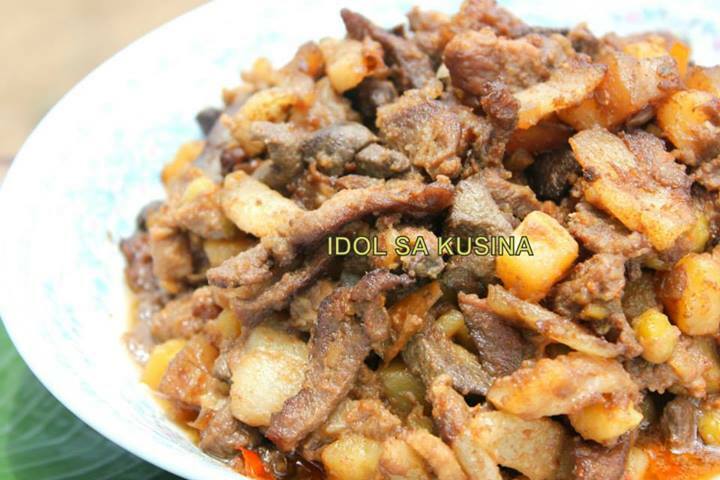 Here's Idol sa Kusina Recipe for Episode 105/Aug. 18- SEAFOOD CONGEE. 1. Heat a wok or pan over high heat and the vegetable oil. Once smoking, add the ginger, shallots and diced mushrooms and stir-fry for a few seconds. 2. Add in the squid, clams, mussels and shrimp, and stir-fry until the shrimp changes color. Toss in the cooked rice. 3. Then add the reserved mushroom stock and vegetable stock and bring to boil. Season the mixture with the rice wine, light soy sauce, salt and white pepper. 4. Add the bok choy stems, bamboo shoots and cilantro stems and cook 1 minute before adding the bok choy leaves. Simmer until the seafood is cooked and the clam and mussel shells have opened. Discard any unopened clams or mussels. 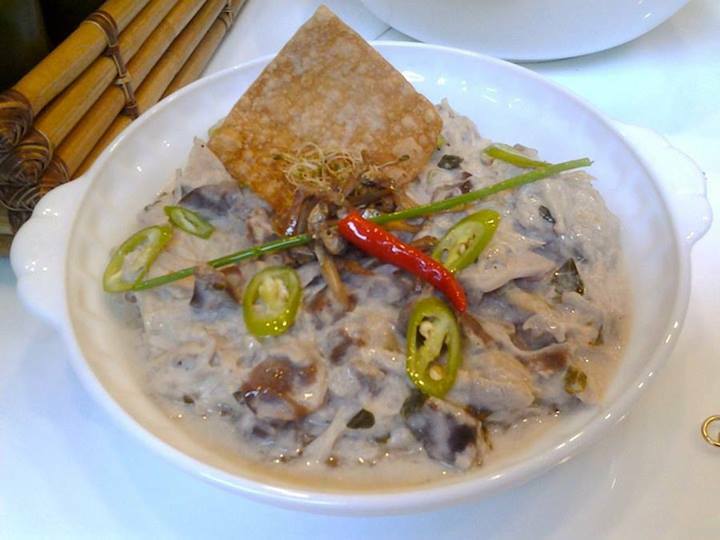 Serve immediately, garnished with the cilantro leaves and top with century egg if preferred. 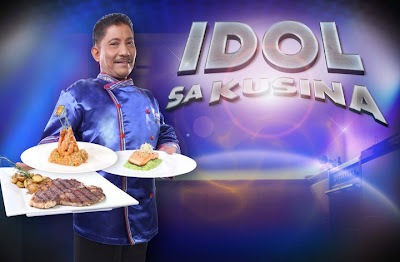 Watch Idol sa Kusina August 18 Episode. 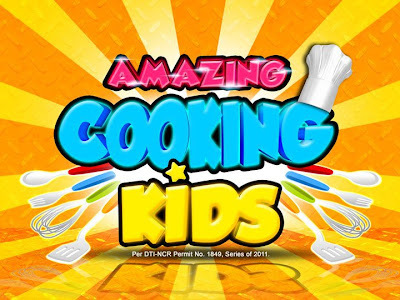 Participating Schools: Dr. Carlos S. Lanting College - Tandang Sora, Q.C.Our Lady of Lourdes Technological College - Novaliches Q.C. Video embed only from YouTube. Credit to Idol sa Kusina and GMA News. 1. Pakuluan ang pork belly hanggang sa lumambot. 2. Kapag malambot na ang karne, timplahan ito ng asin at paminta. 3. Pahiran ng puree ng tanglad, bawang at sibuyas. 4. Para maging mas makapit ang lasa, talian ito gamit ang butcher's string. 5. Iprito sa mainit na mantika. 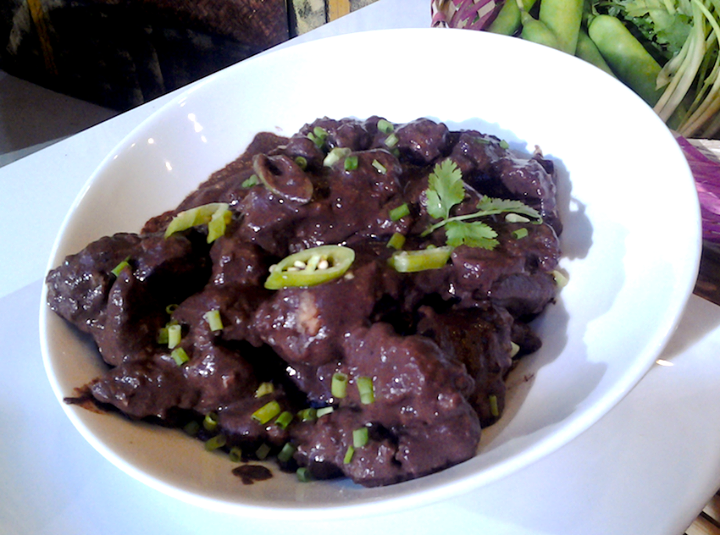 Here's Unang Hirit Kitchen Hirit Recipe of the Day- August 15, 2013: Crispy Dinuguan with Chef Trixie Macasaet. 1. Hanguin ang pinakulang liempo at hiwain ito sa maliliit na piraso. 2. Ilagay ang nahiwang liempo sa binating itlog at pagkatapos ilagay naman ito sa pinaghalong harina at cornstarch na may asin at paminta. 3. Siguraduhing nabalot ang liempo mabuti at saka ito i-prito hanggang sa lumutong. 4, Igisa ang sibuyas, bawang at tanglad. 5. 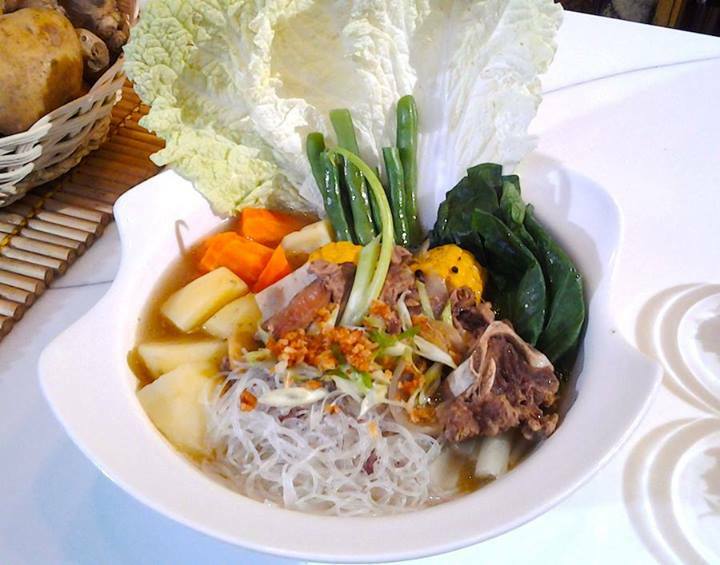 Ilagay na ang beef broth at durugin ito. 6. Lagyan na ngayon ng suka at siguraduhing mabawasan ito nang mabuti. 7. Isunod naman ang gata, pakuluan ito sandali at ilagay naman ngayon ang sariwang dugo ng baboy. 8. Tapusin ito sa paglalagay ng asin at paminta. Ayon sa gusto mong timpla. Watch Yasmin Kurdi's Juice Diet in Unang Hirit- Video. Ibinahagi ni Kapuso actress Yasmien Kurdi sa Unang Hirit ang juice diet at iba pang mga paraan na ginamit niya sa pagpapapayat. Here's Unang Hirit Kitchen Hirit Recipe of the Day- August 14, 2013: Visayan Pride: Bas-uy with Chef Jionne Ocinar. 1. Igisa ang bawang, sibuyas at luya. 2. Idagdag ang pork broth at tanglad. 3. Pakuluan ang atay at idagdag ang luya. 4. Idagdag ang upo, patola, kamatis at ginger leaf. 5. Timplahan ayon sa panlasa. 6. Maari itong budburan ng chihcaron. Isang kakaiba at makulay na food review ang inihatid ng Pop Talk kasama ang Kapuso actress na si LJ Reyes! Video credit: GMA News/ Poptalk. Video embed only from YouTube. R. Lapid’s Chicharon in “My Puhunan"
Watch “My Puhunan” tomorrow (August 14), 4:15 PM on ABS-CBN. 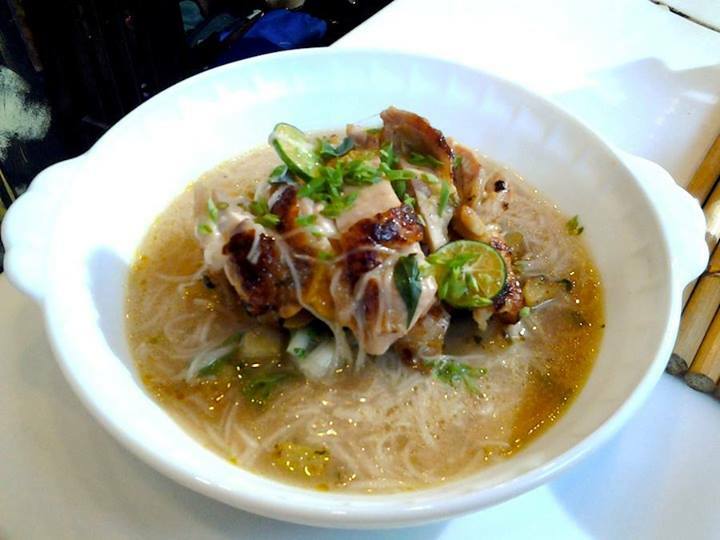 For updates, follow @mypuhunan on Twitter or visit www.facebook.com/MyPuhunan. Rey Lapid started earning from chicharon when he was just nine. He would accompany his father to their stall at a market in Quiapo, where he noticed customers would often ask for the skin of pork to be removed. Rey thought of bringing the pork skin home and have his father fry it. Rey eventually sold the chicharon and people liked it. At age 23, Rey was on his way to success by selling chicharon, and then later on,barbecue and tocino. He made it big when his mini-restaurant in Quiapo gaining patrons. It eventually expanded into 100 branches situated in different areas in the country. Now, Rey wants to share what he’s learned and help married couple Mark Anthony and Rebecca Oracion jumpstart their business. Aside from being given a small capital, the couple will also undergo training at the R. Lapid’s Chicharon factory, with Rey personally mentoring them. 1. Sa isang bowl, pagsama-samahin ang giniling, asin, paminta, bawang at kinchay. 2. Bumuo ng mga meatball at saka ito iprito. 3. Sa hiwalay na kawali, igisa ang bawang at sibuyas. 4. 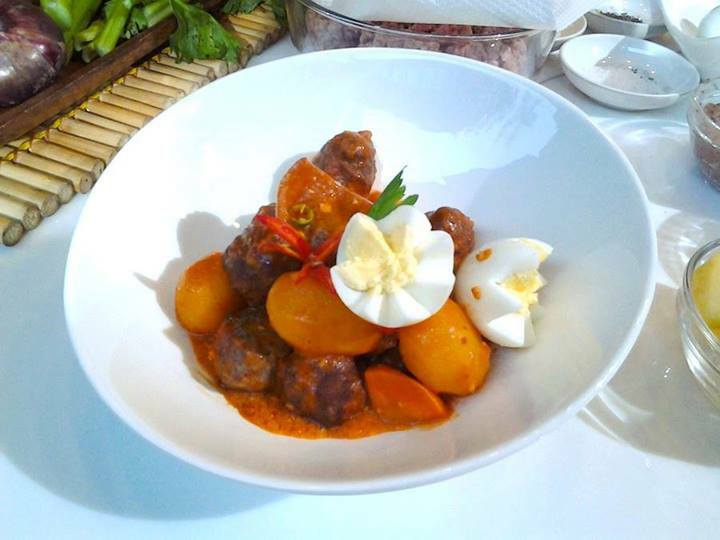 Idagdag ang patatas, carrots, tomato sauce, toyo, pamintang buo, dahon ng laurel at parsley. Hayaan itong kumulo sa loob ng 2 minuto. 5. Dagdagang ng tubig at hayaang kumulo sa loob ng 5 hanggang 8 minuto. 6. Idagdag ang prinitong meatballs, liver spread, liquid seasong at hiniwang sili. Idagdag ang nilagang itlog. Muling pakuluin hanggang sa maluto. 7. Timplahan ayon sa panlasa. 8. Maglagay ng keso at bell pepper. Hayaang matunaw ang keso at hanguin. 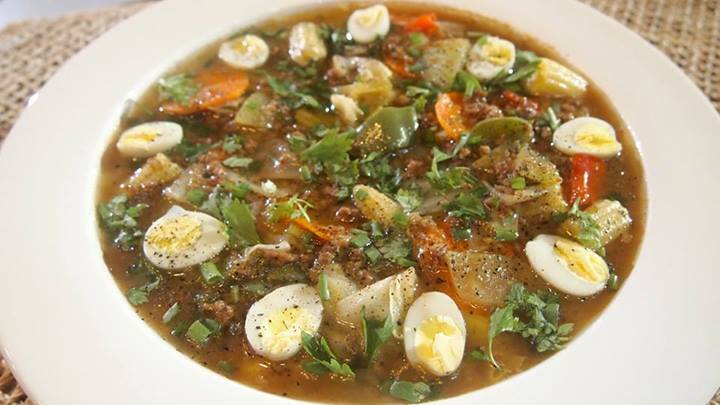 Here's Unang Hirit Kitchen Hirit Recipe of the Day- August 12, 2013: Tinolang Buto-buto with Chef Rency de Jesus. 1. Lagyan ng paminta at asin ang buto-buto. 2. Igisa ang sibuyas, bawang at luya. 3. Ilagay ang buto-buto at lagyan ng patis, hugas bigas at tanglad. 4. Ilagay ang papaya at siling haba. Pakuluan. 5. Ihalo ang dahon ng sili. 6. Timplahan ayon sa panlasa. Good eating necessarily begins with good cooking. In “Idol sa Kusina” , good cooking is at its best with Chef Pablo “Boy” Logro. He whips up food fit for kings and sultans! Yes, for his domain includes the royal kitchen of the Sultan of Oman. He finished international culinary training in Italy, Switzerland, Spain, United Kingdom, Turkey, Singapore, and Japan and is a master chef in Oriental, Mediterranean and Western cuisines. In “Idol sa Kusina” , good cooking is at its best with Chef Pablo “Boy” Logro. Video replay embed only from YouTibe. Credit to GMA News/Idol sa Kusina and he uploader. 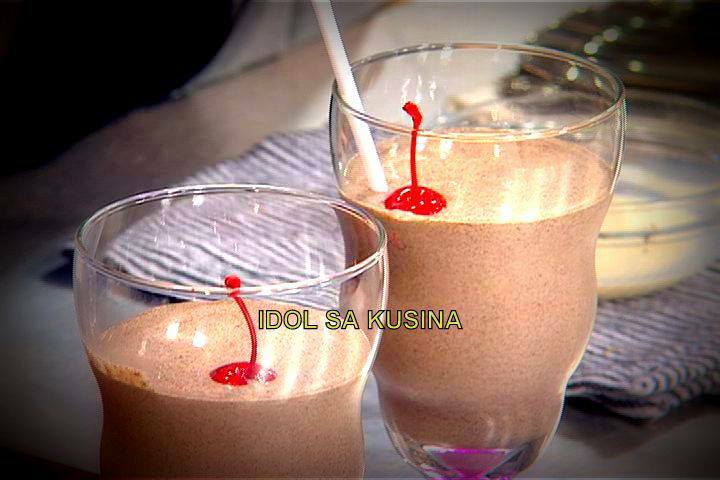 Here's Idol sa Kusina Recipe for Episode104/Aug. 11- SUMAN WITH CORN AND MANGO SAUCE. In a pot, combine rice, corn, coconut milk, sugar and salt. Bring to a boil and simmer for 30 minutes while stirring. When mixture is dry and sticky, remove from heat and cool. Scoop mixture and place on banana leaf, roll and secure tightly. Steam for 30 minutes and serve with mango sauce. For mango sauce, combine all ingredients in a bowl. 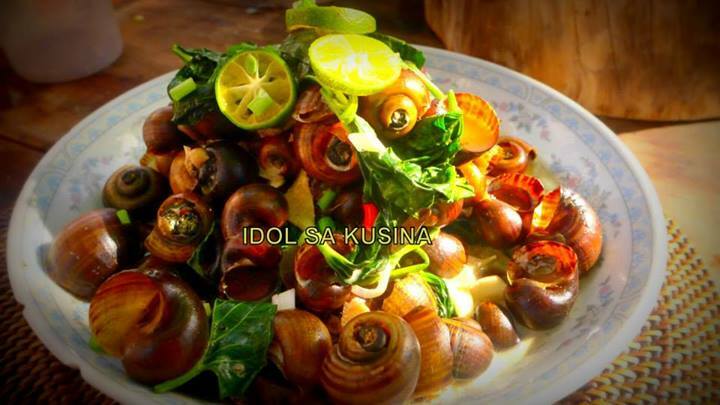 Here's Idol sa Kusina Recipe for Episode 104/Aug. 11- IGADO. 1. Saute onions, bell peppers, potatoes and garlic in oil. 2. Add tomatoes and pork strips, and stir fry until pork is light brown. 3. Add in the liver and pour in the vinegar, soy sauce and the sugar. Season with salt and pepper. 4. Simmer until the meat is cooked, lastly add in the green peas. 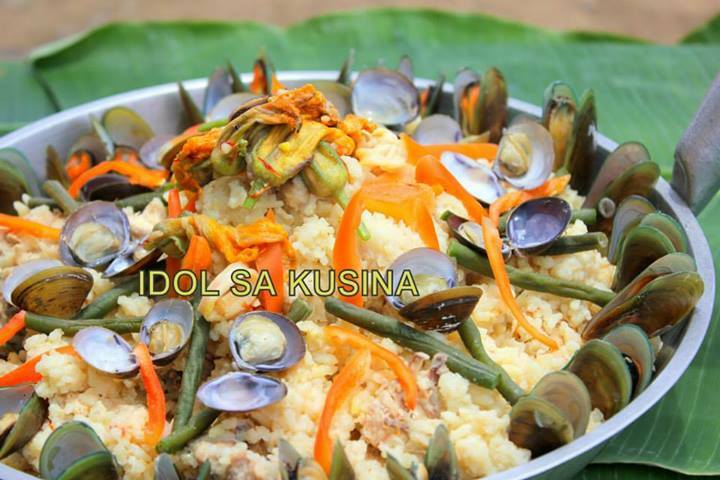 Here's Idol sa Kusina Recipe for Episode 104/Aug. 11- ARROZ ALA RIZALINA. 1. Saute onions, tomatoes in oil and butter. Then add the chicken pieces and brown it. 2. Add squid and cook for a minute. 3. Place the rice and toss, making sure rice is coated with the oil. 4. Slowly add the itag broth and kasubha until everything is covered. Spread the meat and vegetables making sure everything is even. 5. Arrange the rest of the seafood around the pan. Simmer. 6. 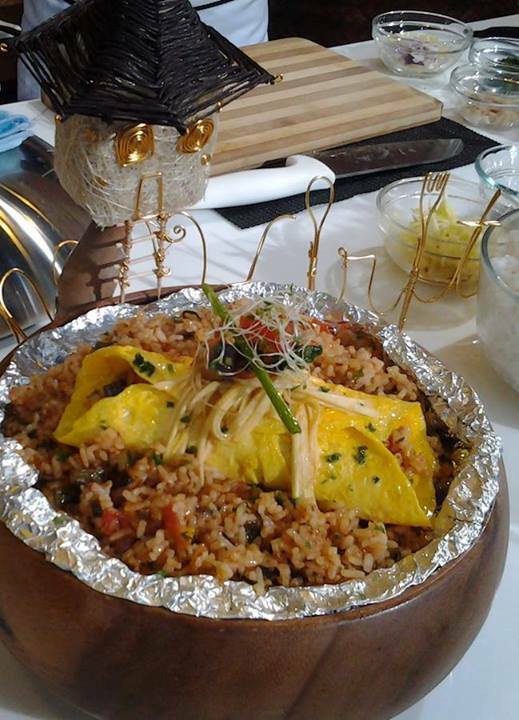 When the rice is almost cooked, add the bell peppers, string beans, squash flower on top and cover with banana leaf. 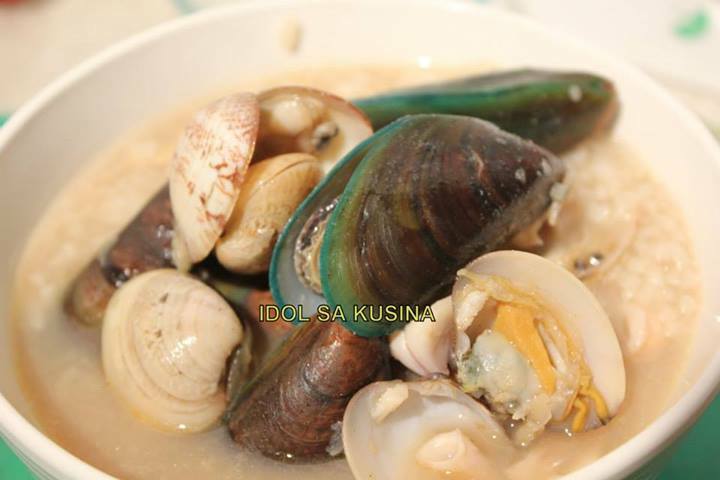 Here's Idol sa Kusina Recipe for Episode 104/Aug. 11- LECHON. 1. Pour boiling hot water over the pork, remove the skin with a sharp knife and skewer in a long bamboo. 2. Season cavity or pork with salt, pepper, calamansi, laurel leaves and lemongrass. 3. Roast pork over hot coal while basting with oil until done. 4. Place corn in the mouth of the roast pork instead of apple. 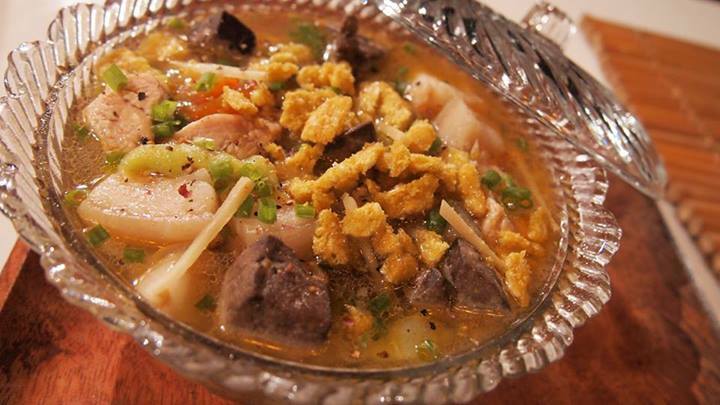 Tonight-August 11, Ang Pinaka lists down the Top 10 Yummiest Restaurants in Bacolod. Get ready to drool again, Team Pinaka! This Sunday, ‘Ang Pinaka’ brings you part ten of its series of monthly food trips as host Rovilson Fernandez and field correspondent Maey Bautista take us to a grand tour of the different home-grown restaurants around the City of Smiles, Bacolod! 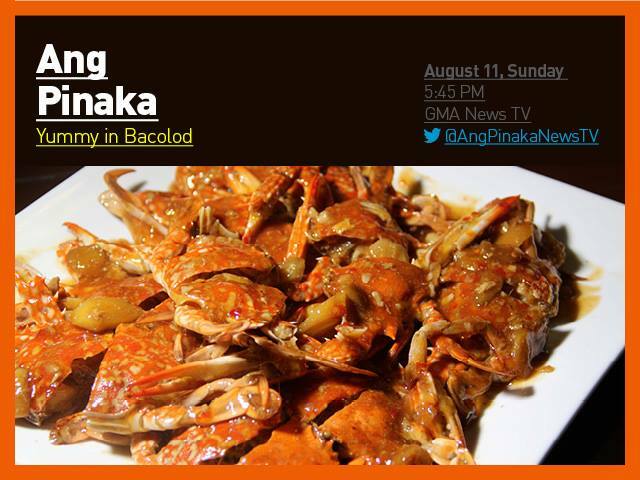 Find out the Top 10 “Ang Pinaka: Yummy in Bacolod” this Sunday on ‘Ang Pinaka,’ August 11, 2013, 5:45 PM on GMA News TV. 1. Igisa ang luya, siling haba, kamatis, bagoong, talong, sitaw, mustasa at tomato sauce sa mantika. 2. Idagdag ang cooked rice at budburan ng kaunting vetsin at haluin. Set aside. 3. Iprito ang itlgo at i-wrap ang fried rice sa nalutong itlog. Ihain kasama ang manggang hilaw o green mango salsa. 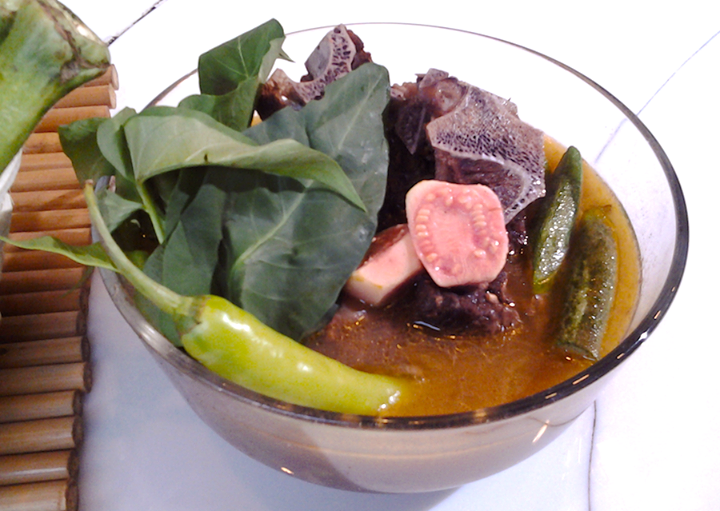 Here's Unang Hirit Kitchen Hirit Recipe of the Day-August 8, 2013- Putaheng Bisaya: Utan ug Buwad with Chef Jam Melchor. 1. Ibabad ang daing sa tubig upang mabawasan ang alat nito. 2. Punasan ang tubig sa mga daing at hayaang matuyo. 3. Pakuluan ang mga gulay na gabi, kalabasa at labong hanggang sa maluto. 4. Idagdag ang sitaw, okra at talong hanggang sa maluto. 5. Isama ang daing at timplahan ito ng asin ayon sa panlasa. 6. Ihulog ang malunggay, sibuyas na mura at alugbati. 7. Hayaan itong kumulo hanggang sa maluto. Here's Unang Hirit Kitchen Hirit Recipe of the Day- August 7, 2013- Pesang Tulingan with Ensaladang Kamatis with Chef MJ Nicasio. 1. Iprito ang tulingan. Itabi. 2. Sa isang kaserola, igisa ang luya, sibuyas at kamatis. 3. Lagyan ng tubig o hugis bigas. 4. Haluan ng asin, pamintang buo at patis. Hintayin kumulo. 5. Ilagay ang isda, bokchoy o pechay at leeks. 6. Para sa ensaladang kamatis, hiwain ang kamatis, pipino at sibuyas. 7. Sa isang mangkok, tunawin ang asukal at asin sa suka. 8. Ilagay ang kamatis, pipino at sibuyas. 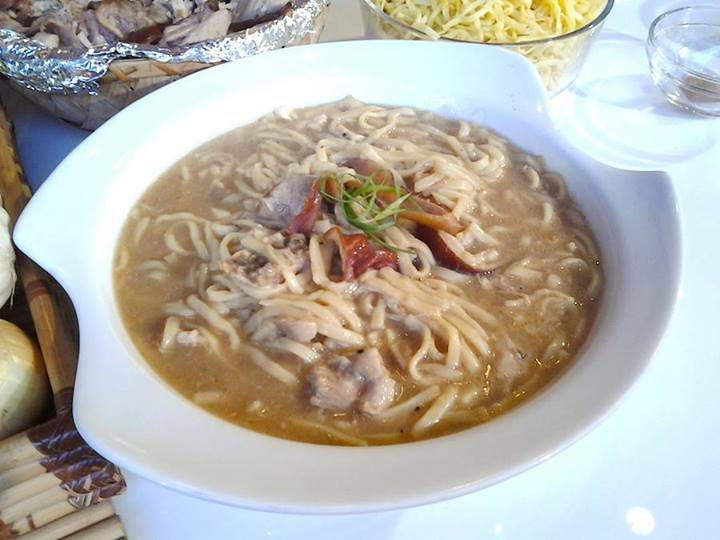 Here's Unang Hirit Kitchen Hirit Recipe of the Day: Sarciadong Manok with Chef Manny Nario. 1. Hatiin ang manok, linisin at hugasang mabuti. 2. Balatan at i-dice ang patatas. 3. Balatan at hatiin ang kamote at i-set aside. 4) Alisin ang buto ng bell pepper at hatiin. I-set aside. 5. Linisin at hiwain ang onion leeks. I-set aside. 6. Balatan at i-chop ang garlic. I-set aside. 7. Balatan at hiwain ang sibuyas. I-set aside. 8. Linisin, alisin ang buto at hiwain ang kamatis. I-shred. 9. Alisin ang tomato paste sa lata. I-set aside. 1. Maglagay ng tubig, asin at half boiled potato sa isang cooking pan. 2. Sa parehong pan, alisin ang tubig at initin ang pan. Lagyan ng oil at iprito ang kamote. Set aside. 3. I-deep fry ang chicken. Kapag 40 percent nang luto, i-set aside. 4. Tanggalin ang oil at mag iwan ng kaunting amount. 5. Igisa ang sibuyas, bawang, kamatis hanggang sa maamoy ang aroma nito. Ilagay ang manok, fish sauce, bay leaves at paminta. 6. Ilagay ang chicken stock, i-boil at ireduce sa simmering stage. Lagyan ng patatas at tikman. Patuloy itong lutuin hanggang sa luto na ang manok. I-double check ang lasa. 7. Sa isang serving plate, ilagay ang manok at igarnish ito ng fried kamote, bell pepper, at leeks. Ihain nang mainit. 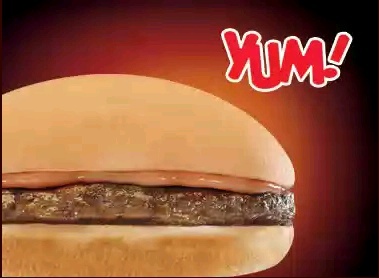 Jollibee Yum named the best-tasting burger on 2013 IPSOS Blind Product Test for Burger. Teens may differ in their likes and wants, but when it comes to burgers, Jollibee Yum is their only choice! Jollibee Yum is the best-tasting and only langhap-sarap burger (based on 2013 IPSOS Blind Product Test on Burgers)! Meanwhile, here are some of the best Jollibee commercial through the years. 1. Igisa ang bawang at sibuyas sa isang kaserola. 2. Gayatin ang mais at idagdag ito sa paggisa. Pakuluan. 3. Dagdagan ito ng tubig at hayaang kumulo sa loob ng ng tatlong minuto. 4. Ilagay ang mga hiniwang parte ng bangus at pakuluan hanggang sa maluto ang isda. 5. Ihulog ang dahon ng sili at muling pakuluan. 6. Timplahan ito ng asin o patis ayon sa panlasa. 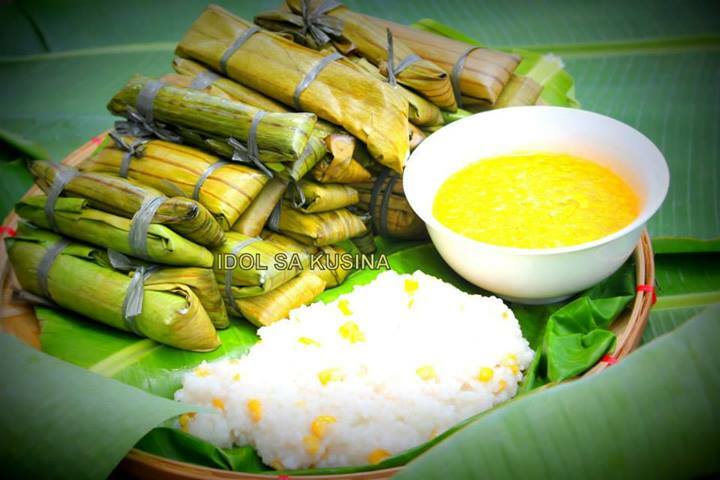 Here's Idol sa Kusina Recipe for Episode 103/Aug. 4- Kilawing Kambing. 1. Burn hair of the goat from the skin, then boil the meat in water, ginger, laurel and salt until soft and tender. 2. Cut the goat into small pieces and marinate in vinegar, labuyo, ginger, onion and salt. 3. Place sliced cucumber on the side for garnish. Here's Idol sa Kusina Recipe- Episode 103/Aug. 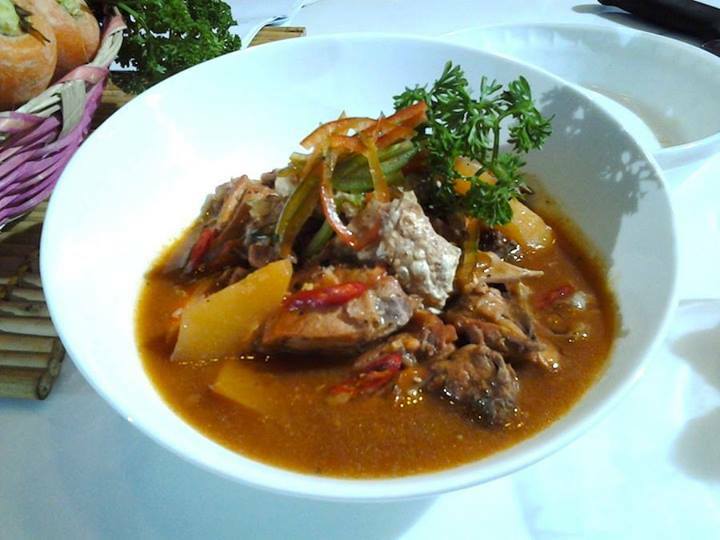 4- KALDERETANG KAMBING. 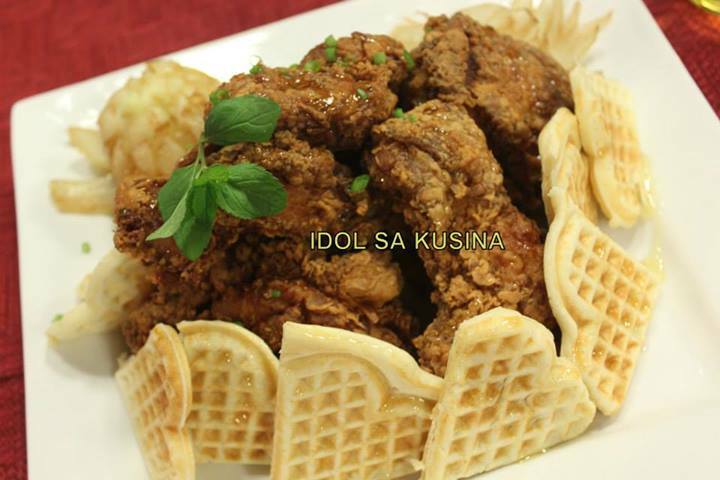 Here's Idol sa Kusina Recipe for Episode 103/Aug. 4- PANCIT CABAGAN. 4 cup vegetable oil for frying. 1. Place pork belly in a small pot, pour water and bring to simmer. Simmer for 30 minutes. Season with MAGGI MAGIC SARAP and continue to simmer until tender. Remove pork belly and set aside to cool. Reserve pork broth. 2. Once pork is cooled, pre heat oil for deep frying. Deep fry pork for 5 minutes or until golden brown and crispy. Strain and set aside. 3. Meanwhile, boil water in a pot and blanch miki for 3-4 minutes. Strain and rinse with cold running water. Drain and set aside. 4. Season liver with MAGGI MAGIC SARAP. Heat oil in a wok or large pan and sauté for 1 minute. Pour pork broth. Bring to simmer and add soy sauce. 5. Stir in miki and blanched vegetables. Stir fry for 1 minute. Add more pork broth if mixture starts to dry. Stir in cooked quail eggs. Check seasoning. 6. Transfer into a serving platter. Slice fried pork belly thinly and place on top of the noodles. Garnish with shallots. Serve immediately with calamansi and chili on the side. 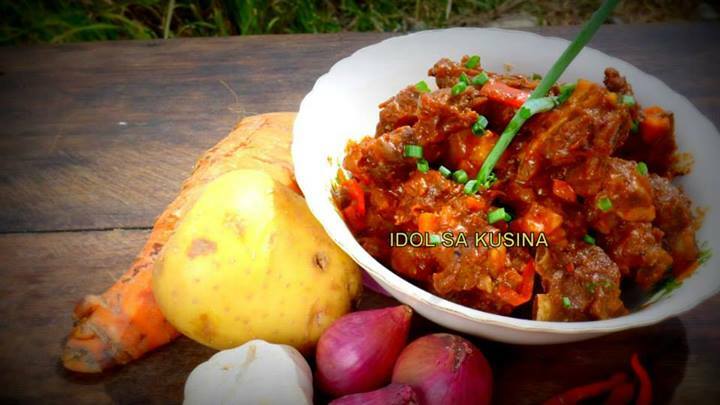 Here's Idol sa Kusina Recipe for Episode 103/Aug. 4- GINATAANG KUHOL. 2. Add the kuhol and season with fish sauce, ground pepper and sugar. Cover and simmer for about 10 minutes. Add the spinach. Remove from heat. 3. In another pan, melt butter and add labuyo. Wait until butter is a little brown then turn off heat and squeeze a little lime juice. 4. Drizzle chili lime butter onto snails and garnish with chopped spring onions. You can watch the episode, please click HERE! 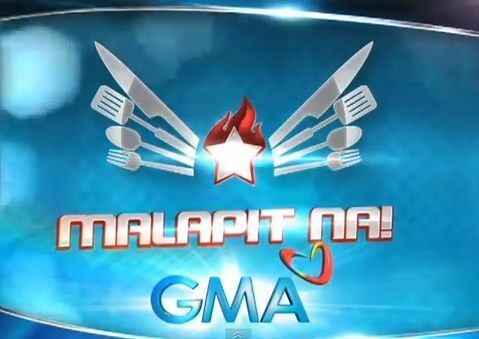 Watch Idol sa Kusina- August 4, 2013 Episode. Buhay na simple. Buhay sa bukid. Yan naman ang ma-i-experience ng ating Idol sa Kusina na si chef Boy sa farm sa Isabela. 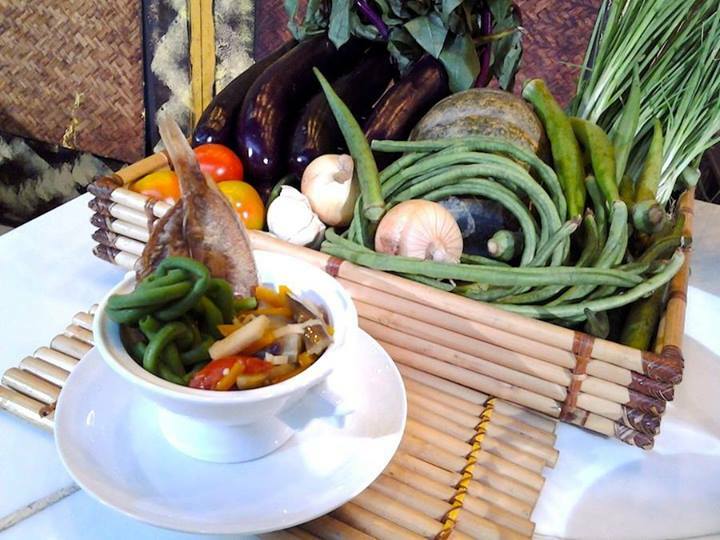 Catch Chef Boy Logro's experience sa kabukiran, on GMA News TV 11 every Sundays at 6:15pm. 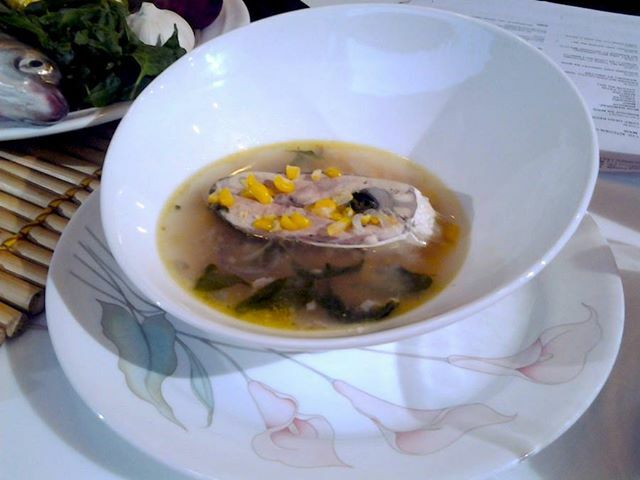 Unang Hirit Kitchen Hirit Recipe of the Day: Sinigang na Mackerel with Chef Hasset Go. 2. Idagdag ang mackerel at iluto sa loob ng 3 minuto. 3. Isunod ang tubig at pakuluin sa loob ng 10 minuto. 4. Lagyan ng kamias o santol. 5. Timplahan ito ng patis. 6. Ihalo ang kangkong, takpan at hayaang maluto ang gulay sa loob ng 5 minuto. 7. Timplahan ng asin at paminta. 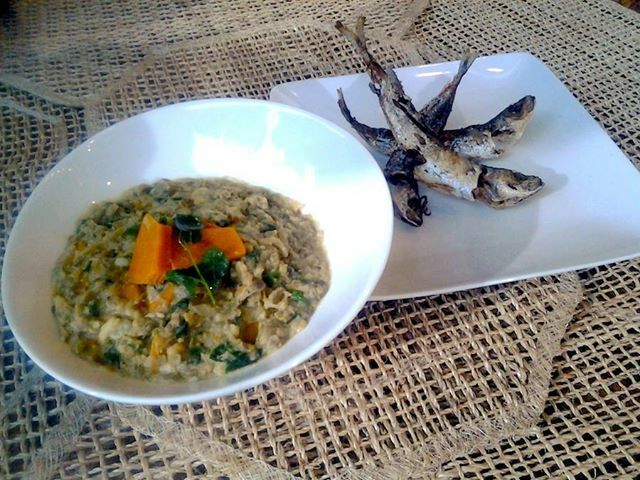 Unang Hirit Kitchen Hirit Recipe of the Day: Ginataang munggo with Crispy Galunggong with Chef Dang Adrias. 1. Hugasan at pakuluin ang monggo sa tubig hanggang lumambot. 2. Igisa ang bawang sibuyas at luya sa mantika. 3. Idagdag ang hipon, dahon ng laurel at gata. 4. Hintayin kumulo at ilagay ang kalabasa at monggo. 5. Lutuin hanggang lumambot ang kalabasa. 6. Lagyan ng asin at ilagay ang malunggay. 7. Prituhin ang galunggong hanggang maging malutong. Watch Kris Aquino cook Oysters Rockefeller. Kitchen Magic with the Stars present: Oysters Rockefeller. Oysters are one of the most versatile kinds of seafood out there. Welcome your guests with a sophisticated, creamy, and cheesy option—Oysters Rockefeller cooked with MAGGI MAGIC SARAP! This creamy Magical Alimango dish cooked with MAGGI MAGIC SARAP is quick to prepare and will allow your guests to eat the crab the traditional way—with their hands.